I’m so homesick right now as I look through my photos of real roast duck, slow-cooked pork belly with mushrooms, and other delicious Chinese dishes from when I was off for winter break. Jia and I went to a Chinese restaurant called Harmony Cafe this past weekend but in my opinion, it really didn’t measure up to authentic Chinese cuisine. I wanted hot pot with spicy peanut sauce or pork or red bean buns and instead I ended up getting a flavorless ma po tofu and beef chow fun. DAMN YOU DC WHY DON’T YOU HAVE A HALF-DECENT CHINATOWN!? One can only have so many cupcakes in a given time before she starts to go insane. Nevertheless, the room is now as clean as it will ever be in that rush to get rid of any lingering bad spirits, but I haven’t found anything red to hang up for good luck. I’m still contemplating what I’m going to have for dinner tonight, seeing how any Chinese food that I order will be sub-par, but maybe we’ll manage to find something edible? 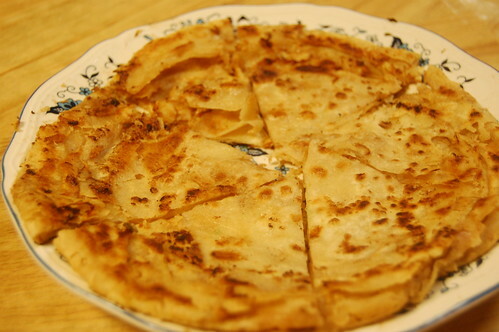 When I was home our entire family chipped in to make these simple scallion and peanut butter pancakes. Since finding the recipe via userealbutter, I don’t think my parents have ever really felt the need to buy them at our local Asian supermarket. This was also the first time we tried using peanut butter with a light sprinkling of sugar, and OH EM GEE it was delicious. Next time I’m voting to try using red bean paste. I think red bean + anything pan fried = heaven. AAAAAAAAAAAAAh. Just a note for this recipe: The measurements given are just a guesstimate. I found that there was not enough water, so I had to add a little extra to get the right consistency. Just trust your instinct until you can feel with your fingers the texture that you’re looking for and then you’ll be fine. You’re going to dust your board with a lot of flour as well so even if it is a bit sticky at first, it won’t be for long. In a large bowl, mix the flour gradually with the 1/4 cup of water until the water is completely absorbed. Continue adding water in small increments and mix thoroughly until the dough begins to pull away from the side of the bowl. Let it rest for about 20 minutes and cover with a damp towel. Cut the dough into about 6 pieces of equal size and roll them into balls. Place dough onto a well-floured work surface and roll out into a thin circle about 1/16 inch thick. Spread teaspoon of oil evenly over the pancake. [I find that it’s easiest to just use your hands to do the spreading, even if it is a bit messy. The oil is more uniform that way and it’s much quicker.] Sprinkle salt evenly and then curl the roll into a spiral from top to flatten it. Roll the pancake out to 1/8th inch thickness. Heat about a tablespoon of oil on a flat, wide pan over medium low flame until it’s hot. Set the pancake in oil and let it fry until the bottom becomes crisp and golden. You’re looking for a couple of those little brown spots but not too many of them. Flip, adding more oil if needed. Remove from heat and slice. You are currently reading Happy Lunar New Year! at Notes on Food.